The final day of group play in the 2019 Ylvisaker Cup on Sunday, Feb 3 at the International Polo Club Palm Beach featured a full day of polo to determine the tournament’s four semi-finalists. Having already secured their place with a 2-0 record, Pilot defeated SD Farms 15-6, while the other undefeated team, Patagones, continued their strong play to defeat Coca-Cola 13-9. Attention turned to the remaining two spots, with the winner of both games solidifying their place in the semi-finals. The feature game of the week saw La Indiana display a strong team performance to defeat Iconica 9-6, while Dutta Corp beat Tonkawa 8-6. In front of the grandstand, La Indiana put forth their best team performance to date, led by accurate passing from Facundo Obregon, who effectively utilized Michael Bickford and Toly Ulloa down field as the duo combined for 12 shots in the game. Bickford had an especially strong performance, controlling the ball and taking advantage of an Iconica defense that left him unmarked. Iconica had their chances throughout the game, but inaccurate shooting produced an offense that was unable to keep up. The balanced team effort of La Indiana was ultimately the difference with all four players contributing in the three-goal victory. In the opening chukker, Iconica had opportunities to take an early lead, outshooting La Indiana, but it was the strategy of utilizing Ulloa and Bickford that gave La Indiana a 3-2 lead. With the Iconica defense focused on containing Facundo Obregon and Jeff Hall, it was Obregon that found Bickford with multiple passes, leading to Bickford’s second goal of the game. The two teams traded goals until the end of the first half, when La Indiana outscored Iconica 2-0 in the third chukker. Field goals from Ulloa and Hall gave La Indiana a three-goal advantage. With a tournament best defense entering the game, Iconica was able to fight back into the game, limiting La Indiana to just one goal from the penalty line during the fourth and fifth chukkers. Sebastian Merlos scored back-to-back goals in the fourth chukker to reduce the deficit to just two. However, La Indiana displayed a strong defense of their own to keep Iconica off the scoresheet in the fifth chukker. With a spot in the semi-finals on the line, Maureen Brennan scored her first goal of the game for Iconica, but La Indiana relied on their back line, as Obregon and Hall scored a goal each in the final chukker to seal the 9-6 victory. Facundo Obregon gained MVP honors, while Best Playing Pony was awarded to Sebastian Merlos’ Guri Vanina. The remaining game of the day saw a defensive battle between Dutta Corp and Tonkawa. Usually known for their potent offense, it was Dutta Corp’s exceptional defense that made the difference in the game. Holding Tonkawa off the scoreboard for the entire first half, Dutta Corp was able to build a 4-0 lead thanks to a goal each from Timmy Dutta and Lucas Diaz Alberdi, along with two goals from Kris Kampsen. Kept off the penalty line, Tonkawa struggled to generate offensive opportunities from the field and get past the organized back line of Gringo Colombres and Kampsen. While six second half fouls for Dutta Corp resulted in three penalty goals for Sapo Caset, it wasn’t enough for Tonkawa to overcome the slow start. Despite beginning the final chukker trailing by four goals, Caset brought Tonkawa within one goal with minutes remaining, but a final goal from Timmy Dutta sealed the 8-6 victory, sending Dutta Corp into the semi-finals. 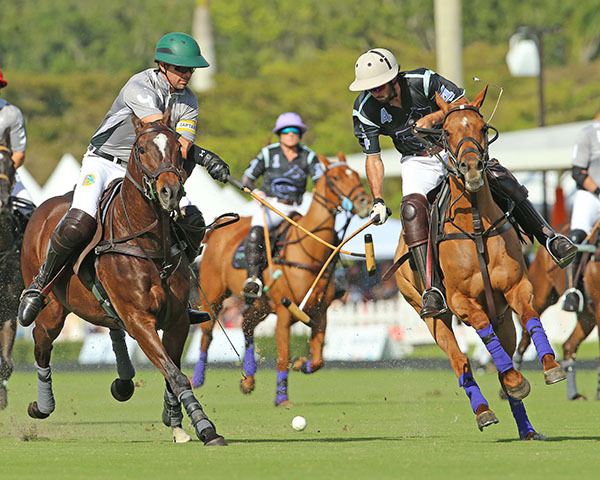 With their spot already secured, Pilot remained undefeated in the first game of the day, thanks to an eight-goal performance from tournament scoring leader Facundo Pieres. The game was close after the second chukker, but Pilot scored 10 unanswered goals to create a large lead and a convincing 15-6 defeat of SD Farms. Meanwhile, the other morning game saw Patagones also claim a commanding victory over Coca-Cola. After conceding the first two goals of the game, Patagones responded with six straight goals, with three coming off the mallet of Benjamin Avendano. The balanced attack of Patagones saw scoring contributions from Avendano, Santiago Toccalino and Tomas Garcia del Rio. Coca-Cola was unable to slow the Patagones offense, ultimately falling 13-9. This weekend’s feature match will be the Ylvisaker Cup final. For more information, visit www.internationalpoloclub.com.